I'm sure you're all surprised but my original intention to review all in one go was thwarted when one place didn't have any supply. 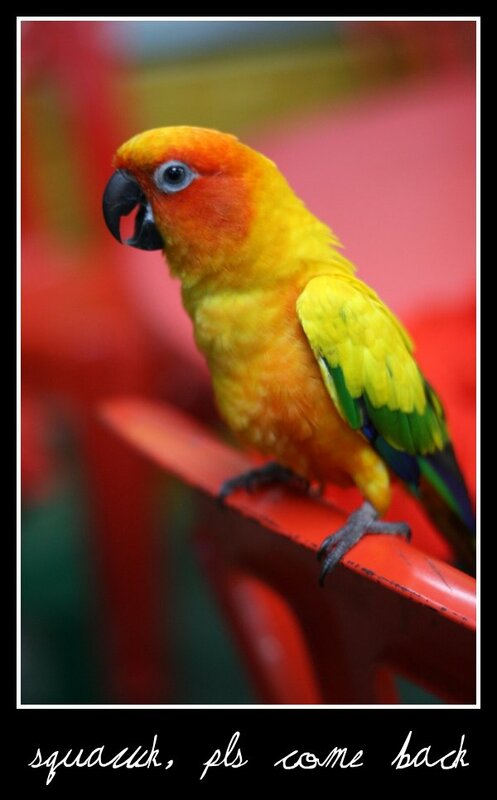 I managed instead to rectify it one weekend by a fluke of good luck. My friend CS had raved about these..., "they're not like the Nathalie's ones as they have a soft top that sinks in the teeth when you bite into them just they way I like them." My curiosity was piqued. BUT, these babies were quite rare and done on occasion. 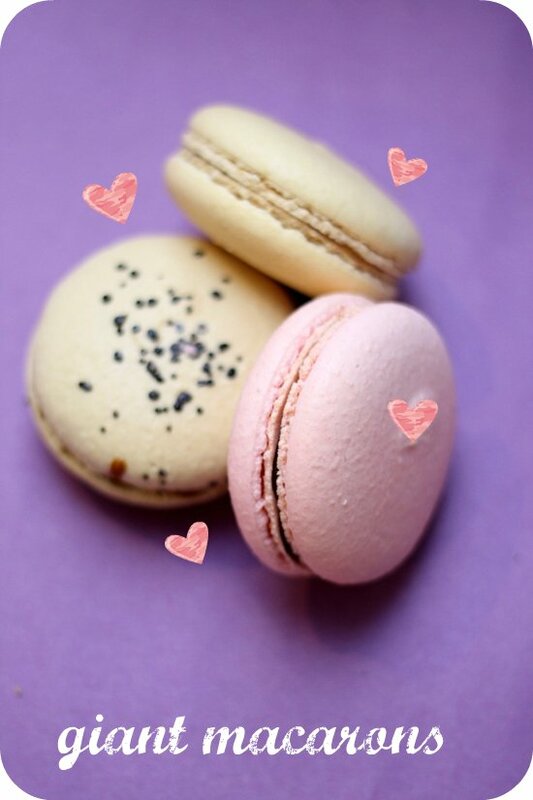 However I struck gold last Saturday, when they had extra orders of rose (pink) and coffee (white with a little coffee powder dust) macarons. Each one is priced at RM3. The verdict - she was right as it was a lovely to bite into, not a hard shell with a soft yielding centre. I didn't think much of the rose one since it had a faint fragrance but my favourite was the aromatic coffee one. 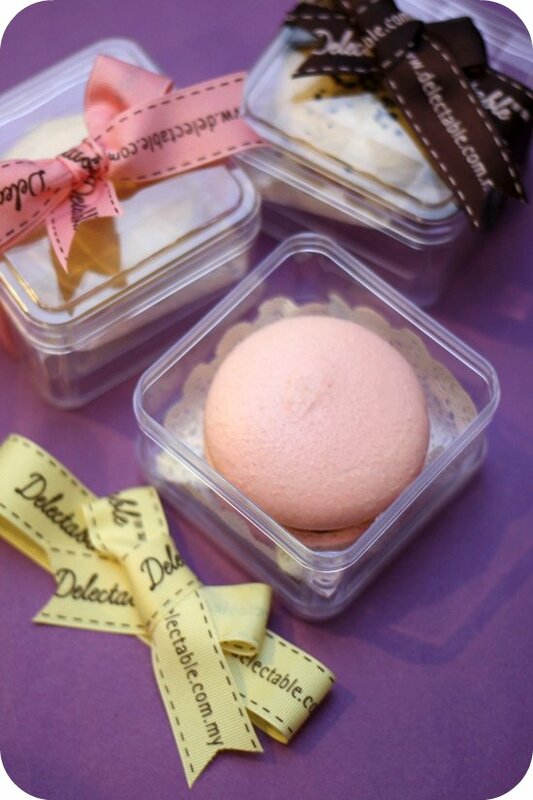 There's a light almost ethereal quality to them just like their cakes, which I reviewed earlier. We had discovered this small cafe located on the upper floors of the maze one fine day after lunch. Since we were all full from lunch, we only sampled some goodies as takeaway. I vowed to return but since it closes on Sunday, it was a little difficult to do so. The weeks went by and last Saturday, we managed to eke some time to visit here. 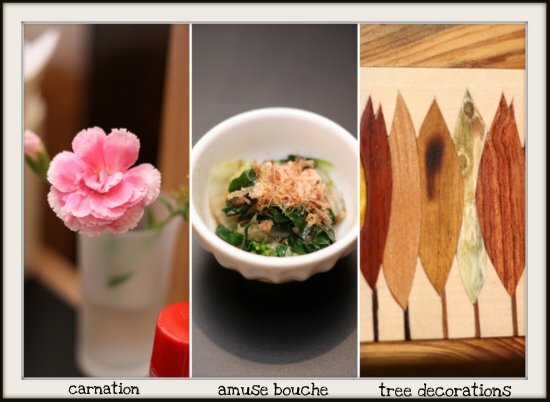 The cafe focuses on simple Japanese fare. Since we had eaten lunch elsewhere, we focused on the desserts. First, it was their signature profiteroles (RM6), all stacked up. The choux pastry is a little hard (probably due to the refrigeration) and each one is filled with chocolate cream. Not particularly memorable I felt but it did make a change since profiteroles are usually filled with custard cream. There's an assortment of French gateaux and we select a Noisette (RM9.90) that is pretty nice since it has hazelnuts. 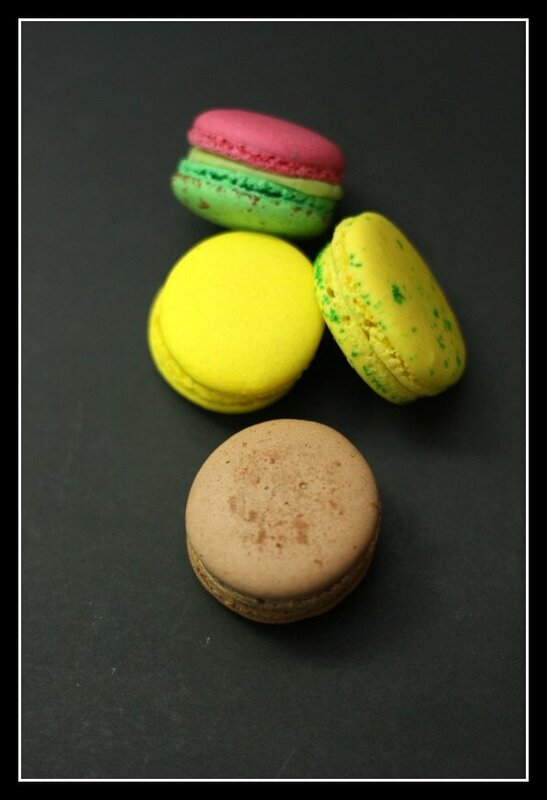 Also on display are a rainbow selection of macarons. This is one of the rare places that has the sakura or cherry blossom flavour but I wade through the many colours and flavours to pick more citrus ones like the citron, the exotic one (yellow with green sprinkles), caramel beurre salt and a pretty dual coloured one with pistachio and raspberry flavours. 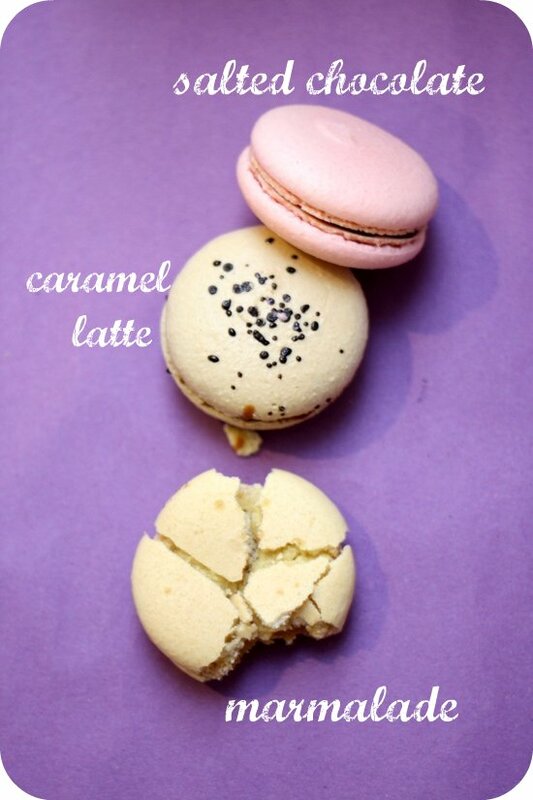 Each macaron is priced at RM4. 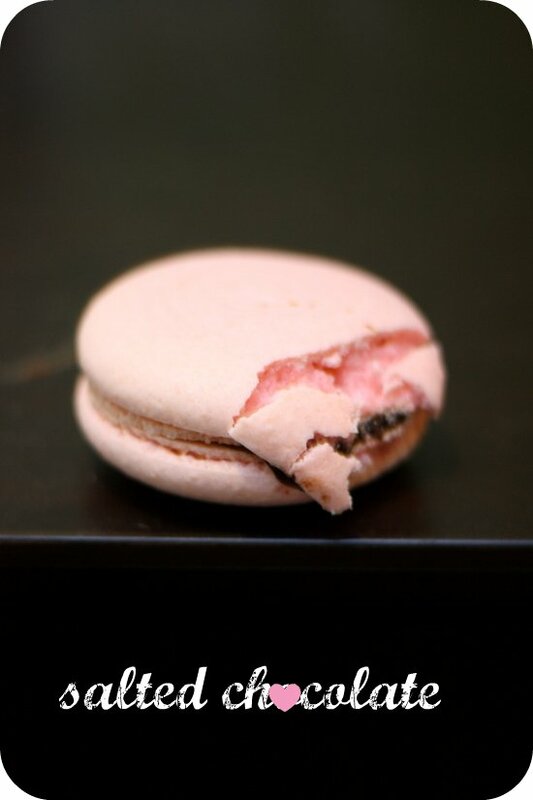 Unlike the earlier macarons, these ones had a harder shell that does not crack so easily that seem to leave a pocket of air from the ground almonds layer. The fillings are pretty nice though and I love the tangy citron and passionfruit flavours of the exotic one. 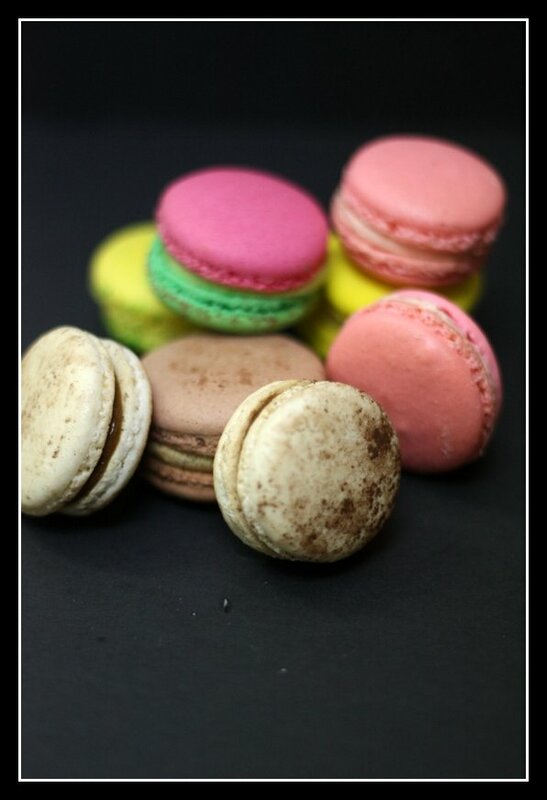 The dual colour macaron looked pretty but turned out to be too sweet. Despite that candy like appearance, there's obvious defects in each of them - the top halves and bottom halves are of unequal sizes. 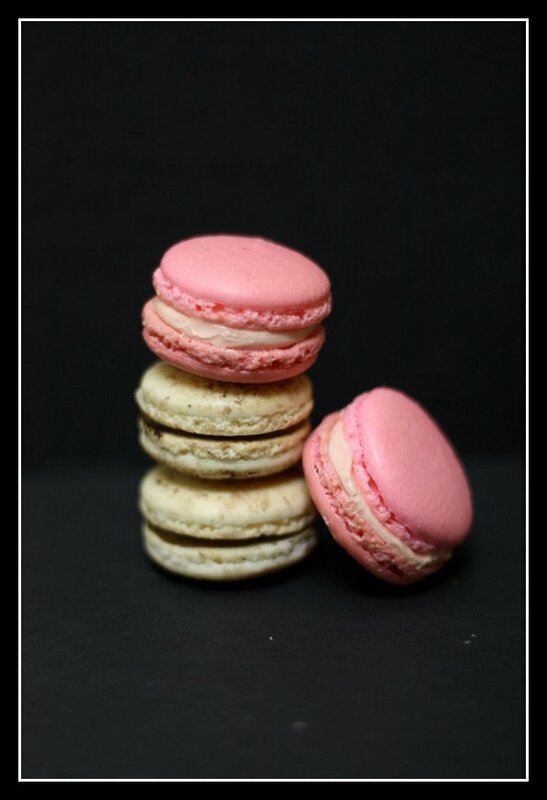 Believe me, it's not easy to get them equal in size as I've tried making macarons before. For more droolworthy pictures, see my Flickr set. Lafite for a lazy lunch?...that sounded like the perfect Friday. Despite the heaving traffic in downtown Kuala Lumpur, I managed to make it to the hotel in a nick of time. There's little tweaks here for the better such as the slightly friendlier service. It's still not perfect though as they tend to leave us to our devices that getting the check was a bit tiresome (waving to get their attention). One major change was the lunch menu. There's a new selection of dishes and different sets available. Firstly, the showcase lunch is priced at RM88++, which includes a selection from the showcase (aka that spaceship shuttle lookalike in the middle of the restaurant, a choice of main course and the dessert of the day. Other set menus also include the Business Set Menu for RM108++, which consists of a three-course meal with a choice of soup of the day or truffle orzo pasta for the appetizer, three choices of protein (meat, poultry or fish) for the main and an affixed dessert. The other set is called Executive Set Menu for RM128++, which is quite similar to the Business Set Menu except it has four courses. You get two starters - a soup of the day and truffle orzo pasta. Then comes the same three protein choices for main and the affixed dessert. A la carte choices are also available. We went for the Showcase Lunch, ordering various choices for our main course. Honestly I didn't think much of the Showcase's selections since it looked almost like a buffet spread - left out a while that it looked mighty dry and lonely. Chief favourites was the tuna tartare served with a squid ink cracker and a dab of avocado puree. Also good was the octopus paired with the sweet mango on a skewer. The pumpkin and coconut cream was a weird combo as the pumpkin didn't have a sweet taste and the coconut cream tasted from a can. The prawn was too salty and the salmon roll with kebab was mediocre. What's lovely to start with is the bread basket especially with its beetroot buns. They have the earthy taste of the beetroot that colours it a beautiful ruby red. 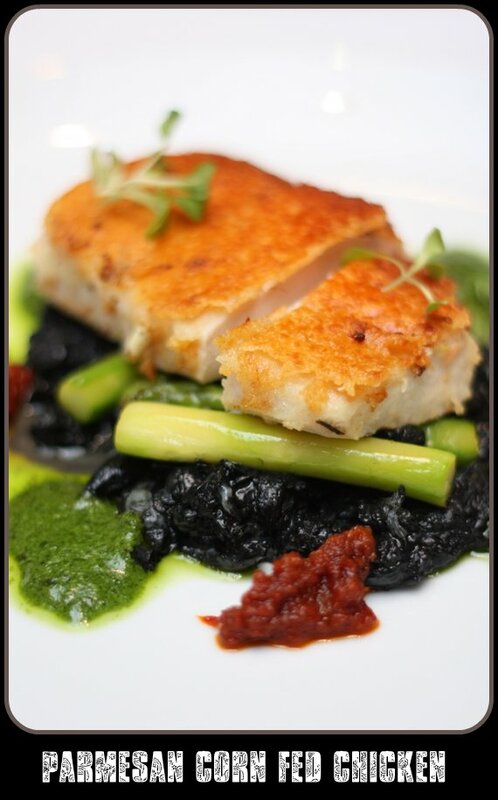 I was blown away by my main course - the parmesan corn fed chicken served on squid ink scrambled egg, green asparagus and pesto. 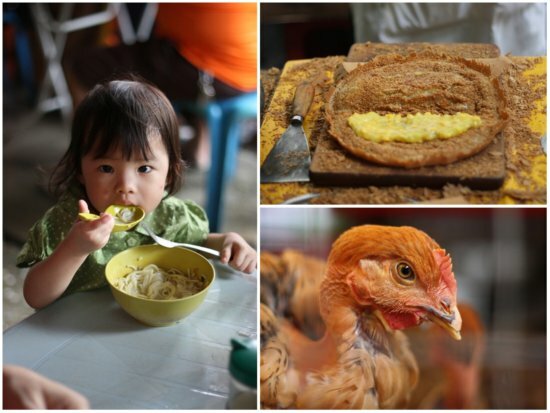 I loved how it resembled the siu yoke with a golden crust. The tender chicken meat is topped with a crispy thin parmesan crust. The black eggs add a nice soft touch to the meat and while it didn't have much taste, it was an eye popping sight. 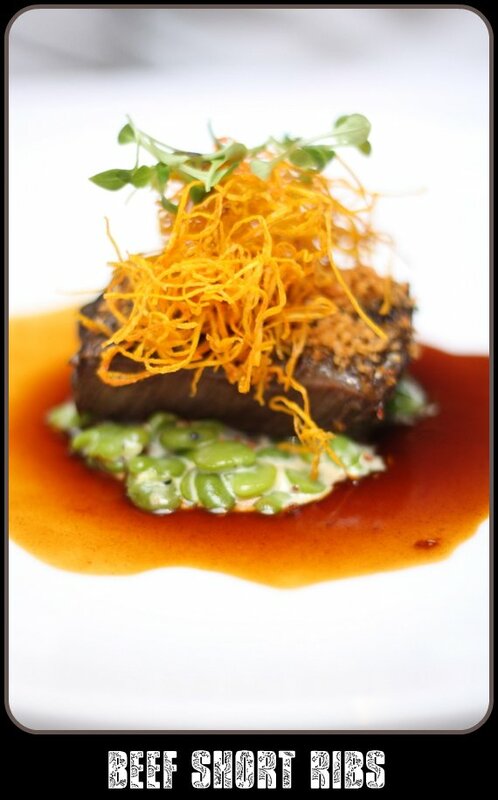 Equally worthy was the American Kobe-style beef short ribs (simply melt in the mouth) with a fava bean ragout, crispy spiced bread crumbles and carrot strow. On the other hand, the citrus thyme cured Norwegian wild salmon had a soft oily mouth feel of the pink fish famous for its Omega-3 oils. 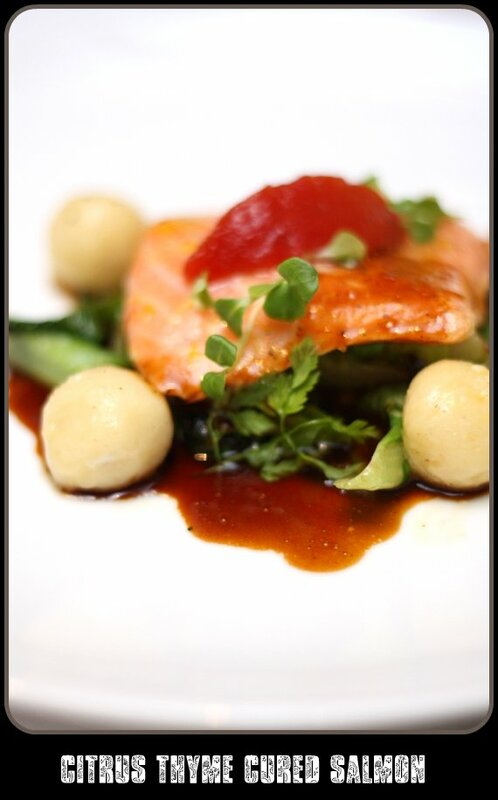 It is served on sauteed romaine lettuce, potato dumplings and lime jus. But I reckon the best was the chocolate bar, an unassuming name for a wondrous dessert. Rich chocolate filling with a beautiful flaky and crunchy crust. 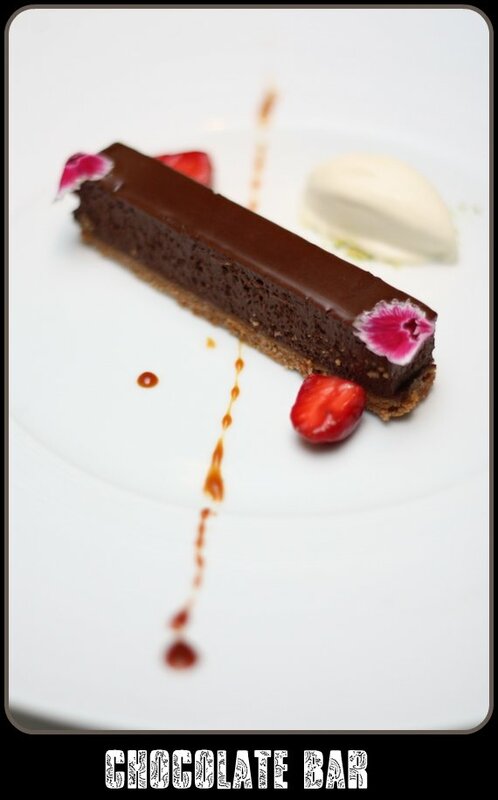 The pink flower and the caramel sauce added a touch of beauty. Simple looking but so divine. Despite the hitches of a cold and boring showcase selection, I must admit I enjoyed the meal at Lafite. It is also slightly less artic in customer relations so it makes pleasant dining. "A new Japanese place?"... that piqued my curious little tummy. At first glance, it is hard to spot this discreet little place. The confusing layers of unlabelled floors in the midst of construction seem to camouflage it so well. Nevertheless, those familiar with this maze seem to have sniffed the place out as it was packed for lunch. We turned up for dinnertime and was surprised to see patrons there even though it was only a few tables. Pretty good considering they are so well hidden from the naked eye. Feeling a little lost around the menu, we felt a way through the menu. 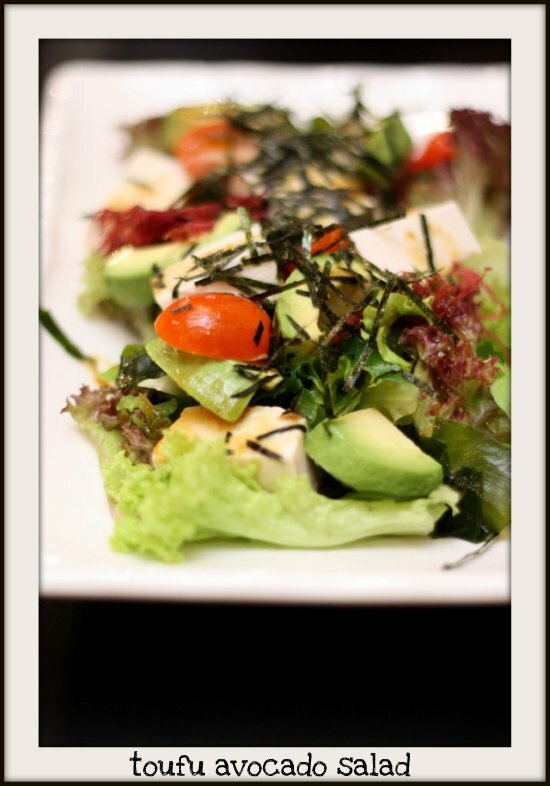 First, it was the toufu avocado salad (RM19) - a refreshing mix of salad leaves, crunchy seaweed, smooth wakame sheets, avocado slices, tofu cubes - all tossed in a wasabi soy sauce dressing. The balance of the wasabi was just right to kick up our appetites. Next, it was one of the picks from the hand written daily specials. We were leaning towards the alluring sound of their homemade deep fried beef mince patty. It must have been good stuff as they had sold it out. Drats! Looks like we need to return to try it. Instead we were steered towards the gyu miso yaki (RM22) - steak marinated in a sweet tasting sauce with a melt-in-the-mouth texture and a nice grilled crispy edges. On the side was a dollop of mild tasting yellow miso to add as a dip. Reminds me a little of my French lamb rack from Cilantro that came with a hatcho (deep red) miso for flavour. I was gunning for the prawns with lotus root but the waiter suggested the hotate iso yaki (RM12) - grilled scallop with two types of mushrooms: enoki and hon shimeji. The broth is sweet but I did feel the scallop was a wee overcooked being a little less succulent. The big misdemeanor was our simple salmon maki (RM15). The seaweed roll with julienne cucumbers and salmon sashimi was laden with wasabi that had both of us blowing our heads apart. Completely mind blowing stuff that would wake up any stuffed nose. Believe me, we won't be ordering this again. They're a little uninventive with makis as the other variety available is filled with minced tuna or negitoro. What we did spy were their specialty of nabe aka the Japanese version of steamboat that they had specially inbuild induction hobs at each table. 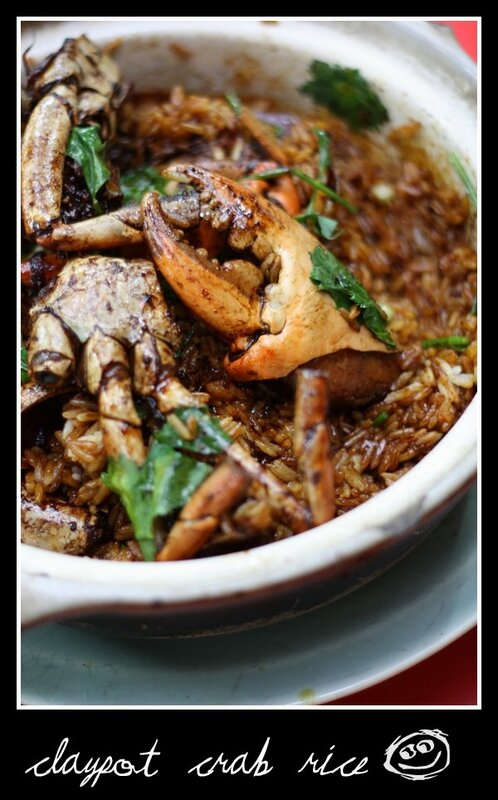 They also serve claypot rice. We reckon we'll return again as the food is simple fare that we like but we'll definitely be avoiding their makis for the time being. 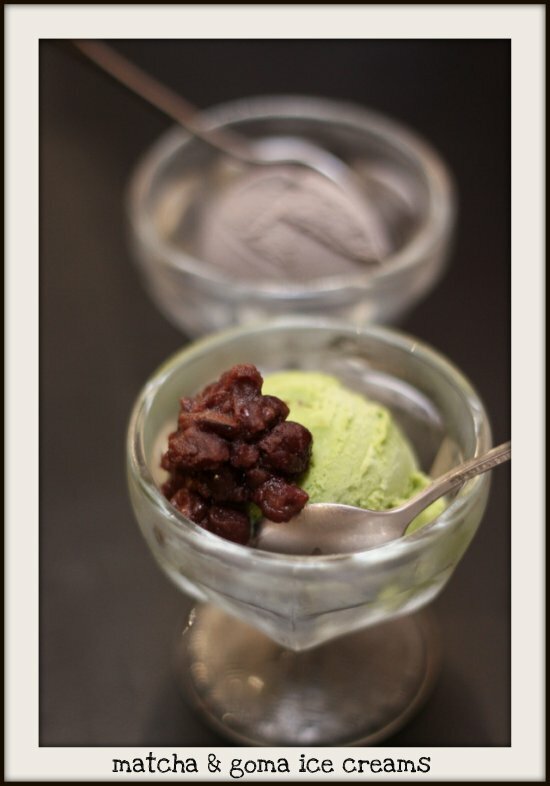 Incidentally, they are also having a special promotion for June, complimentary ice cream (vanilla, goma or matcha) for dessert. We sampled the goma and matcha, which were pretty good stand-bys to beat the heat. Incidentally, it's name has some reference to trees or wood as it's motif is a large shady tree. "PUDU for cendol?" said Splashie Boy with raised eyebrows. I nodded my head. It seemed like an urban legend I had read about. 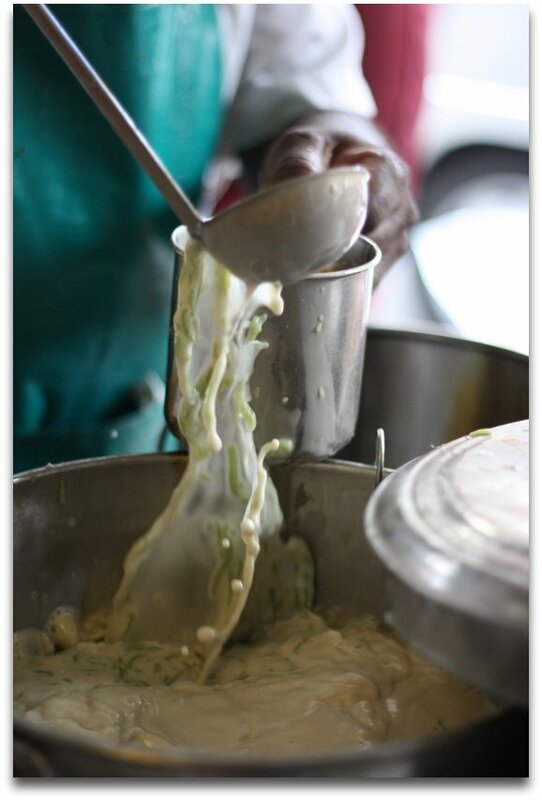 This Indian man that spoke Cantonese and doled out the "green worms" dessert in the most unlikely place, a.k.a. the heartlands of chaotic Pudu. Armed with vague directions and a foursquare listing that just didn't pinpoint the place, we walked aimlessly around the market. In between the crazy maze of stalls, we managed to find time to go snap happy. It's a colourful atmosphere...charged with people of all races and even countries looking for the best fresh deals in town. 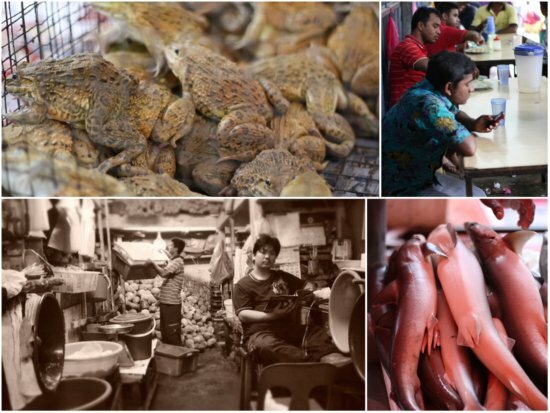 There's all kinds of fish (we spot baby sharks and even spotted sting rays), prawns, vegetables, meats that you wish you had a big basket to scoop it all up. After failing to interpret those directions, we finally did the typical fail-safe method, ask a local where it was and we trooped to the other corner of the market...walked through an alleyway and lo behold, discovered the cendol stall. Phew! I was just thinking to myself it'll be wasted early morning trip to Pudu. One can imagine someone snapping off my head in anger if we came out naught with cendol. 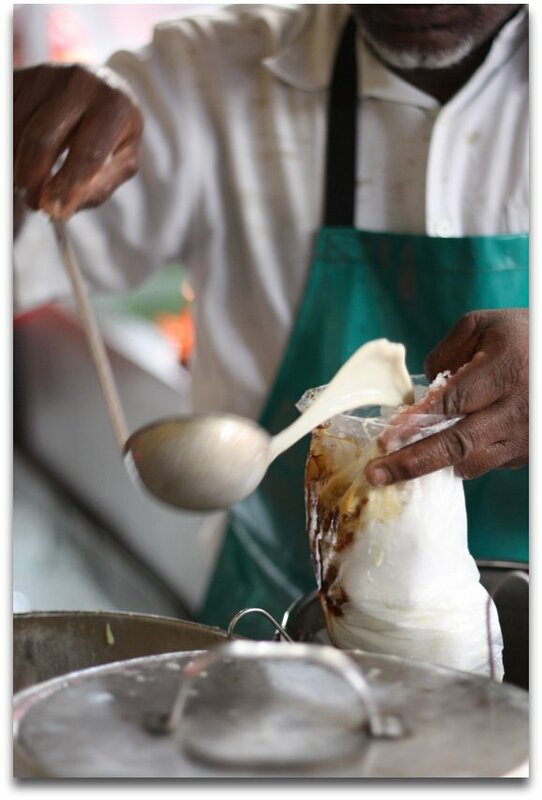 It was all systems go at the stall and everything is done at breakneck speed that even a DSLR can only burst as much to capture the gula melaka tinged coconut milk moving around like a Matrix movie...uncle, please slow-mo! 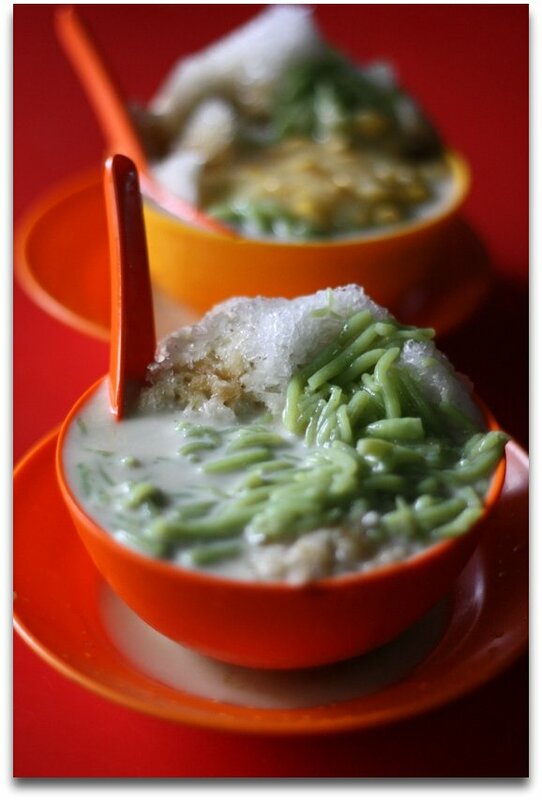 The cendol is good...they're generous with the "green worms" ladling large scoops of it. The creamy coconut milk broth has a faint scent of gula melaka. 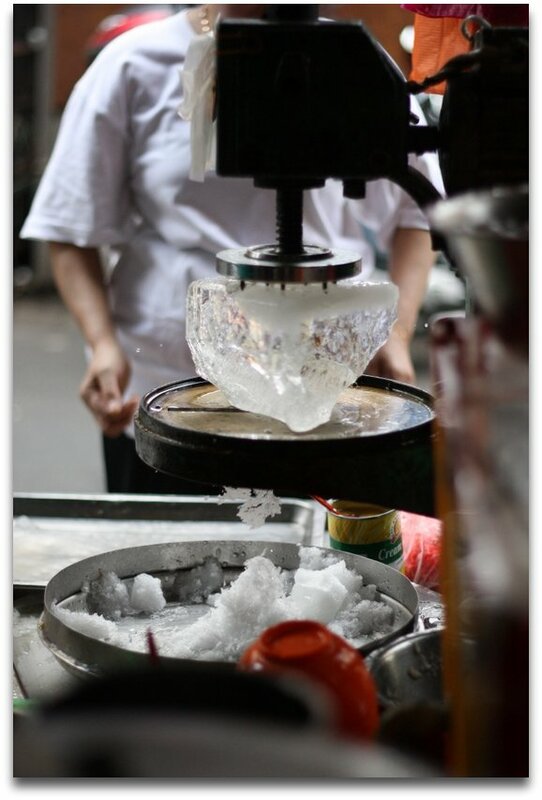 I especially liked how fine the shaved ice is since everything melts quickly. It's a great refresher that we order another bowl to share. 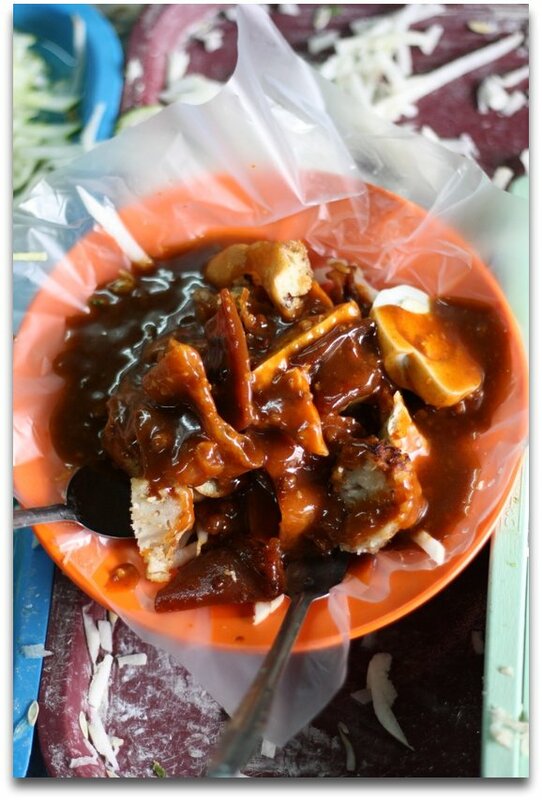 Also sharing the table was the rojak sotong. Not overly sweet with a tinge of chili, the rojak was not the best in town but still pretty decent. With our tummies well satisfied...it dawned on us how easy it would have been to arrive here from the main road. I guess the fun is just taking the wrong turn or else I would not have been able to capture these wonderful pictures in the following trio of collages. Splashie Boy also contributed with the Olympus PEN. The Chinese can sniff out a good thing especially exotic fish. First we had the Soon Hock flooding restaurants, then came Empurau which was touted as the most expensive fish in town, now we have the latest craze in town...the sturgeon fish. It was by fluke I ended up sampling this pre-historic fish as I was asked to go for an impromptu dinner one night. "Sturgeon?" Isn't that the fish that produces caviar?"... I was asking when I got the invite. I admit my curiosity was piqued. Turns out the ancient fish (it is claimed to have lived during the dinosaur's time) may be endangered in China but a nifty group of fellas had decided to rear them here. They had seen similar fish farms in Taiwan and they had brought in the fish and its technology as it needs very clean water to survive. The fish is also high in calcium, packed with antioxidants and fatty acids and collagen rich since it has a cartilaginous skeleton. 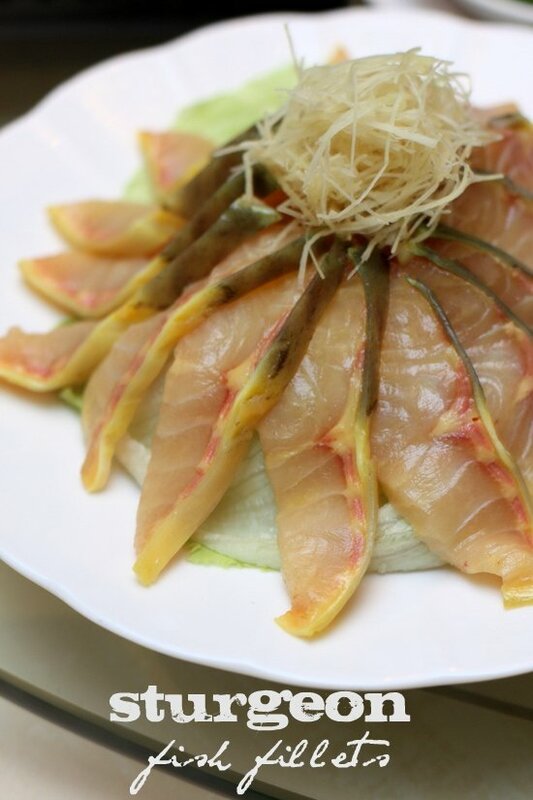 The fish was highly sought after in the olden days in China and reserved for the Emperor that earned its nickname wong yue, literally translated in Chinese as Emperor's Fish. 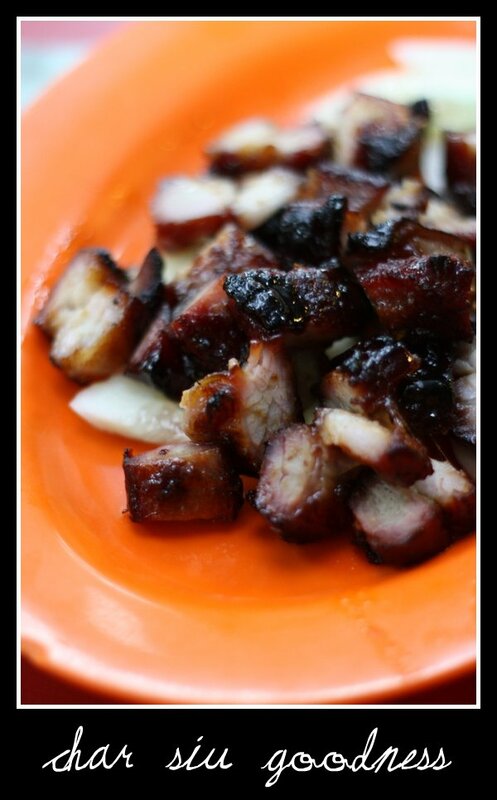 It is also known as chum loong yue in Chinese. Luckily we don't need to be an Emperor to dine on this fish as it is now on offer at Elegant Inn for its third anniversary promotion. The eight course meal starts off with the sturgeon fillet cut sashimi style and one of the best ways I reckon to enjoy this fish. 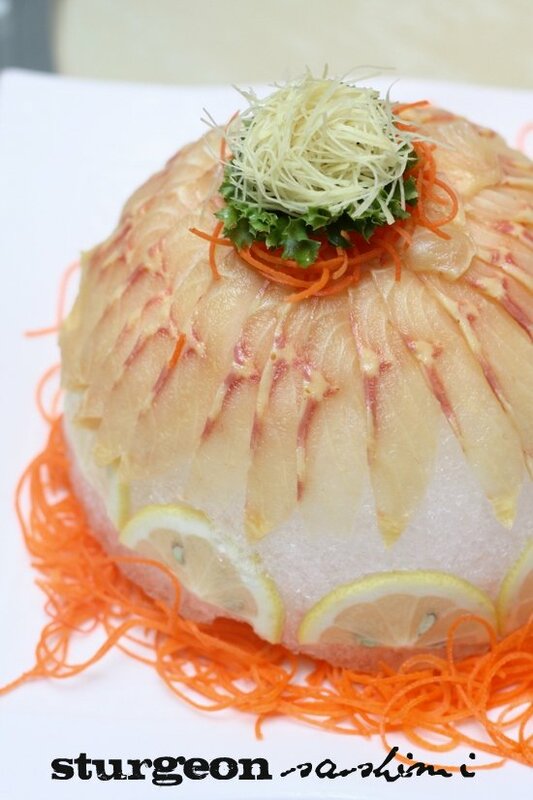 Orange hued slices of the fish is artistically draped over an ice bowl to keep it cool and make you go wow! The sashimi has a sweet taste with a slight bite to it, which I reckon is best eaten without dunking it in soy sauce. 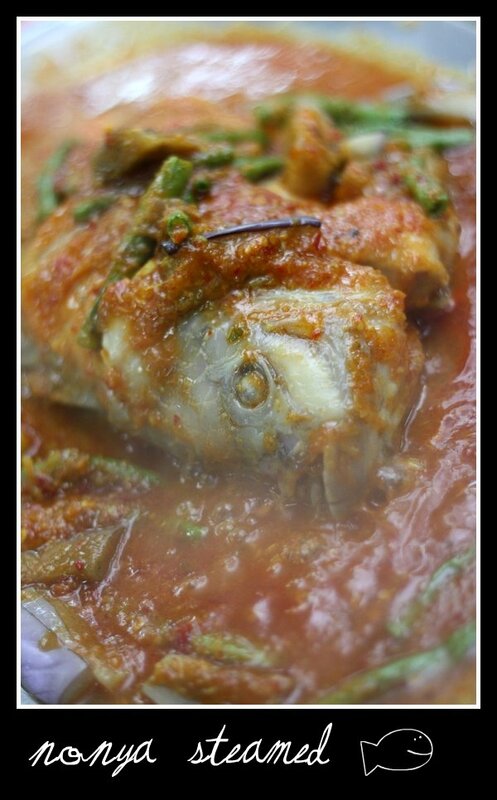 Nothing is wasted for this 3.8kg fish and the cartilaginous bones are deep fried till crisp with a light batter coating. Diced garlic and pepper round up the flavours for this dish. Unlike the usual fish bones deep fried, these one are a little special since you can taste the fatty bits in your mouth that melt away. Even the head is chopped away and double boiled with herbs for soup. We didn't manage to try the soup that night but I can imagine it'll be wonderful (a smooth mouthfeel to each spoonful) since I've tasted shark bone soup and the fish structure reminds me a little of the shark with its firm flesh and rich collagen. The next course is all about contrasts - the deep fried crunch of the sturgeon tail paired with the velvet smoothness from the firm sturgeon fillet. 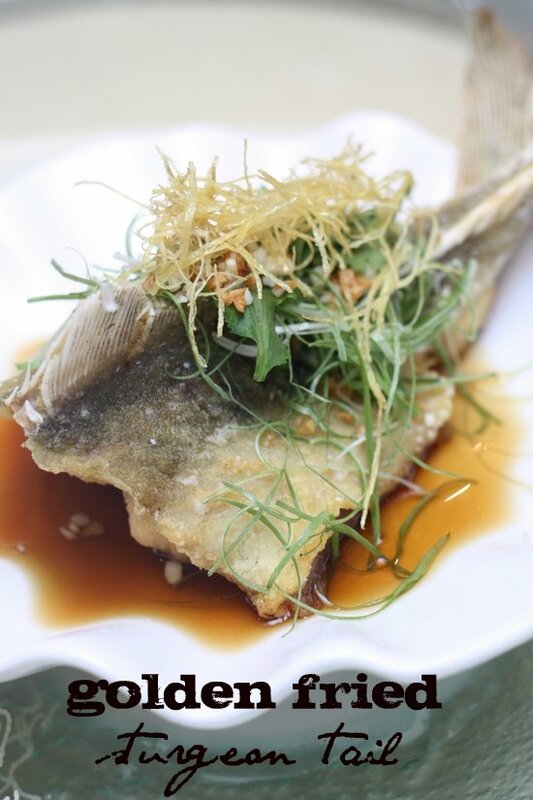 I'm always partial to the side bits of a fish (give me the fin and tail to crunch on and I'll be a happy camper) so I really enjoyed the deep fried taste of the sturgeon tail with the ginger shreds. It's interesting to eat the rich flesh deep fried as it leaves an oily mouthfeel but unlike the Empurau fish, I felt the balance between the flesh and the omega 3 oil within it to be much more balanced (the Empurau felt like it was just oil only). The omega oil also seems to give the fillet pieces a velvet-like sensation that contrasts with the crunchy asparagus and wood ear fungus. 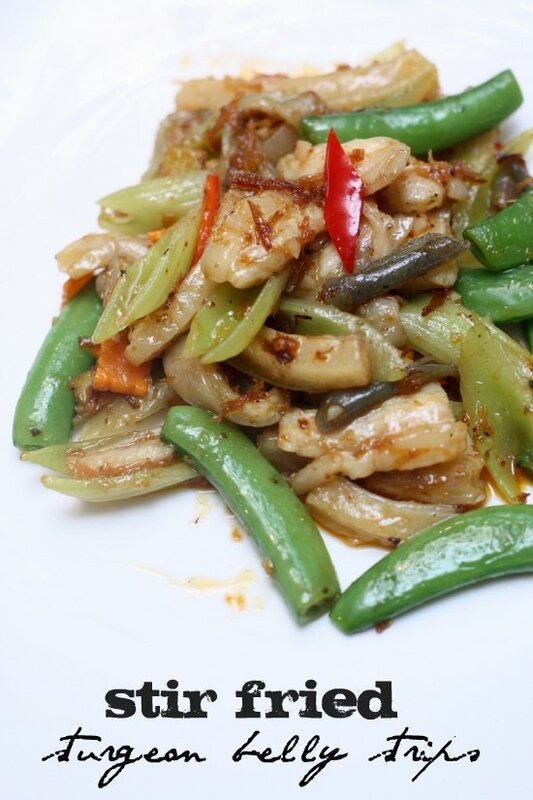 We had also compared the fish fillets with the fish belly slices, that was also stir fried (not available in the menu). The fish belly slices had a richer taste since it had a little bit of the skin. 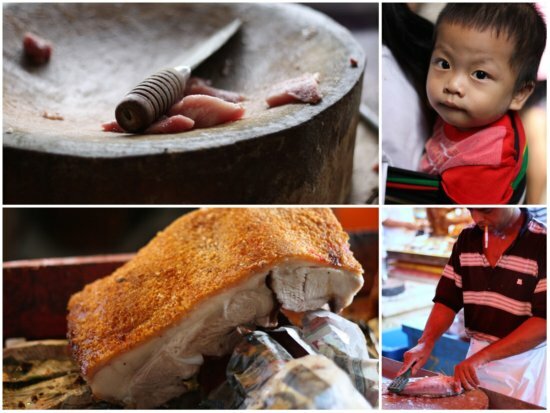 Instead I preferred the fish belly cut into chunks and braised in a claypot with red dates, waterchesnuts, bamboo shoots, soy bean skin (fu pei), mushrooms and roast pork. 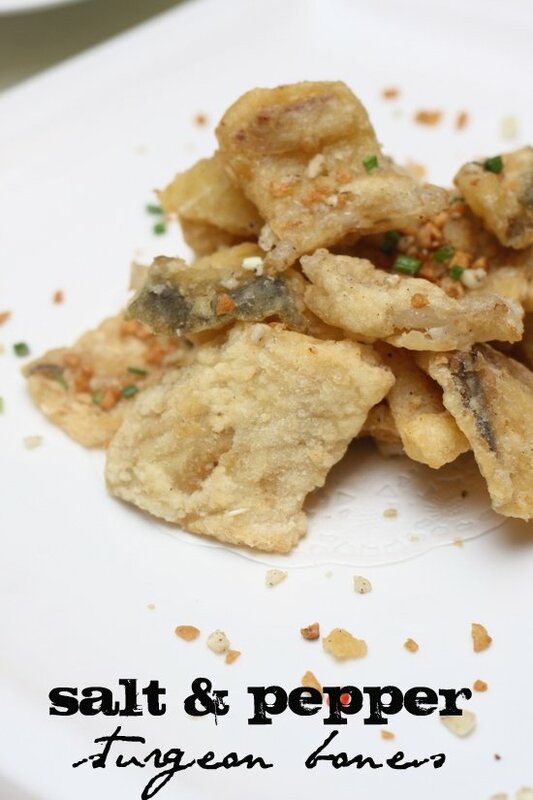 Each bite is wonderful with the rich collagen - yields a little in the beginning and crumbles on the tongue to a smooth mouthfeel taste. 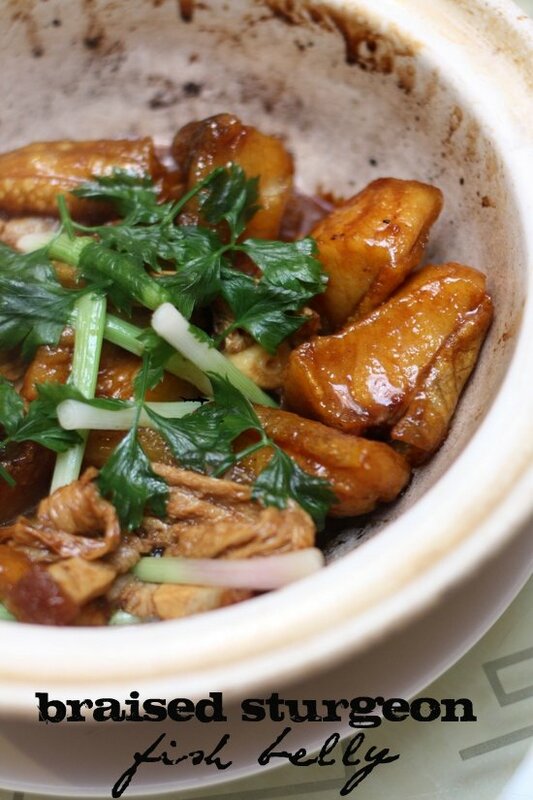 For the feast, it's a choice between the braised and the traditional steamed version. While Elegant Inn does a lovely steamed fish, I must admit it felt a tad ordinary after sampling the fish in so many more exciting ways. 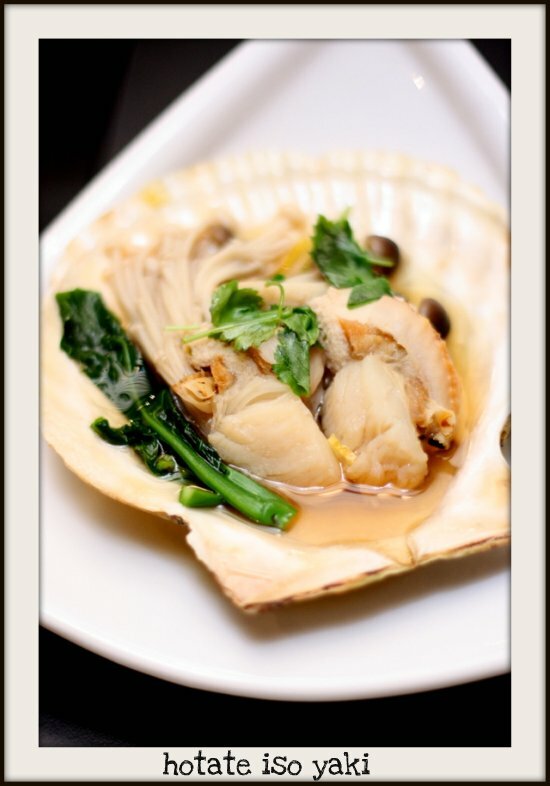 If you're choosing which one to eat the fish belly, my recommendation is go for the braised version for a more unusual taste. For the 8-course meal, there's two courses that are not sturgeon fish. Here you have the first one, a choice between braised six head South African abalone and sea cucumber or Japanese Kobe beef done in Elegant Inn's garlic style (I've blogged about this before in my beef post and it is gorgeous!). The next course is the last one before dessert - you get twin claypots, one where the sturgeon oil is used to fry rice and the other which contains brown rice porridge to add the sturgeon fish slices. We didn't get to sample the rice dish but the porridge version was wonderful with the sweet sturgeon fish slices. I especially liked the colour of the fish slices as you could distinctively see the golden hued fat glistening under the skin. 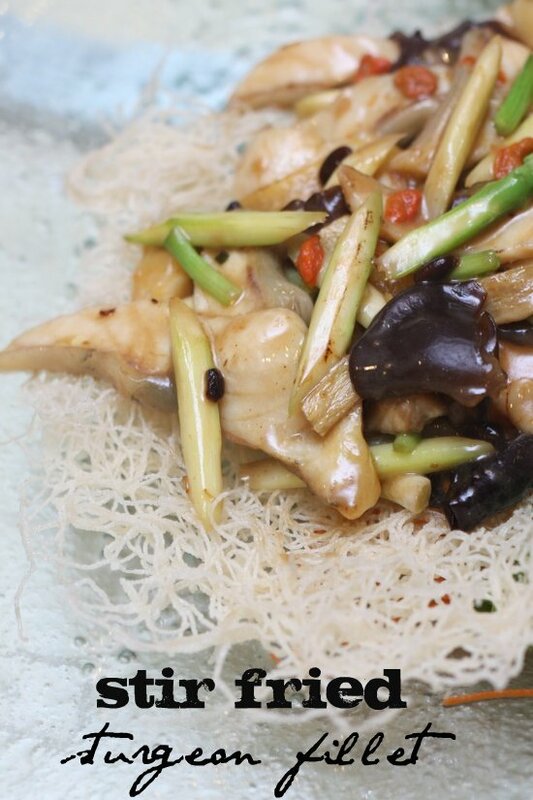 Bird nest tartlettes and double boiled hasma with imperial dates round up your wonderful feast. Definitely a chance of a lifetime to try this fish. 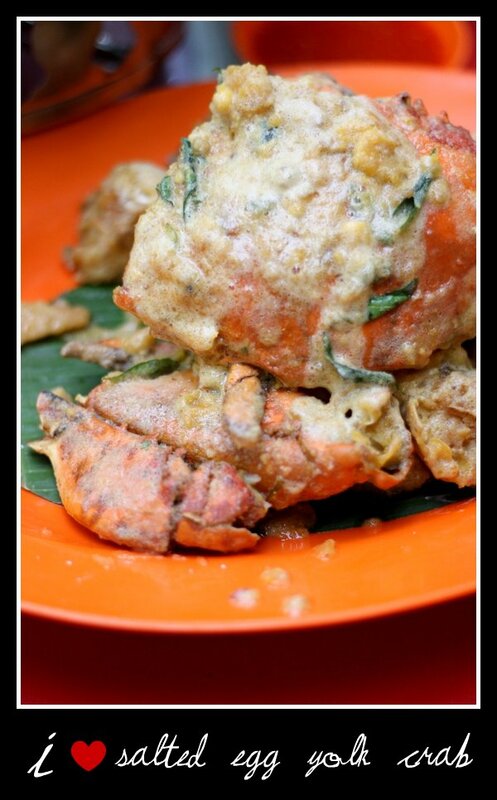 If fish is not your thing, there are other things on promotion from 13 June to 10 July - RM3++ weekday lunch specials, RM33++ twin delights for weekly dinner and even RM333++ lobster meal for 3 persons. 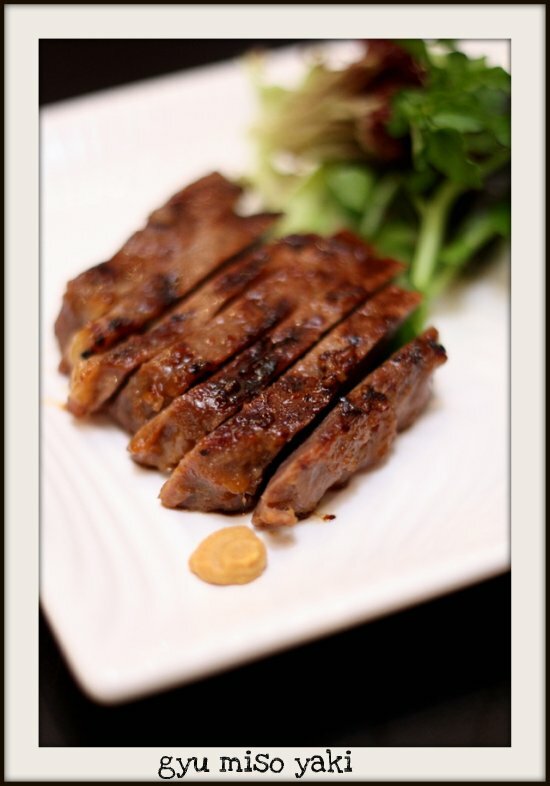 Also on offer is their Japanese Kobe Beef for RM333++ for 300grams. 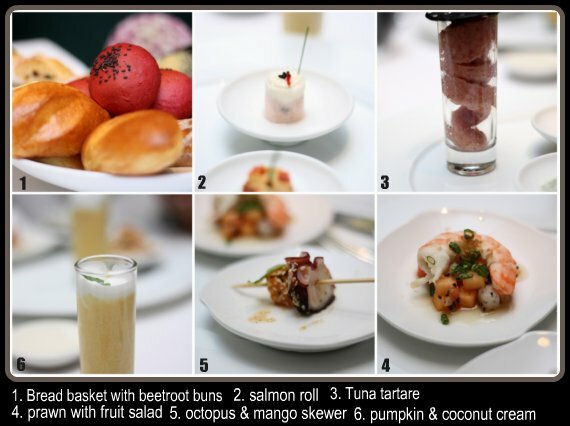 The feast is priced at RM3,333++ for a table of 10 persons. Pre-order 72 hours prior notice required. For the full list of items in the feast, see this link and this one. More pictures are found in my Flickr set. * This review was an invited one.